Being a leader isn’t easy. And when you feel like you’re spinning, it can seem next to impossible to be the leader you know you can be. I work with leaders just like you: Highly capable, smart, and dedicated, but worried that their approach just isn't as effective as it could be. My job is to help you stop spinning and start moving forward. 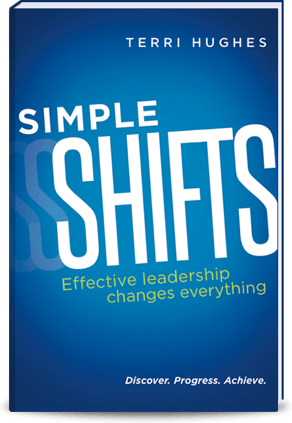 Are you ready to make a simple shift? For nearly 30 years, I’ve worked with leaders to discover their strengths and lead them to success. My strength is insight: I have an ability to strip an issue down to its essence. Problems seem less complicated; solutions become achievable. I connect with leaders because I’ve been one myself. I was a vice president and director of leadership development and organizational change for a national retail corporation. I understand the special challenges that leaders face, no matter what industry they’re in — I’ve worked with leaders in manufacturing, technology, corporate retail, health care, finance, real estate, government, small business, higher ed, non-profits, and more. My background has given me tools and training, but the real work happens every time I meet with a client. I help leaders create practical solutions to achieve measurable success. I have a bachelor’s degree in communications from Ohio University and I’ve completed post-graduate work in strategic thinking and leadership development through E-Cornell, Harvard, and Boise State University. I’m a graduate of the Coaches Training Institute and am certified in multiple change and transition methodologies and emotional intelligence assessments. It all begins with a simple shift. A simple shift is a small change in a habit or pattern that leads to big changes in your outlook and your approach to work. Over the years, I’ve honed this process to a simple framework around three phases: discover, progress, and achieve. Discover is the first step of the simple shifts process. It’s when we begin to turn over stones: How are you blocked? Why? What keeps you up at night? How is your outlook affecting you and the people around you? What do you need to notice about yourself or your patterns? Dan, a financial analyst, was overlooked for a promotion but didn’t understand why. He was a coach for children’s sports teams and loved and respected by the families in the league, but at work he was infamous for micromanagement and his inability to listen. Dan began realizing that his at-work role models had been ineffective leaders — he looked up to them, just like the kids Dan coached looked up to him. He realized he could integrate the Dan who was great at listening and coaching with the Dan who managed a team of colleagues. He eventually earned a promotion and now serves as the chief financial officer for another division of his company. Once you’re aware of your blocks we’ll put together a plan to remove them one by one. You’ll work this plan daily — and you’ll begin to see results. Mitch, a leader in a global company, had more than 80 direct reports and mounting responsibilities. He was overworked, frustrated, and exhausted. Instead of spending his days planning and strategizing, he was subsumed by everyday problems and tasks. During the discover phase, Mitch realized he volunteered to directly tackle every issue his team brought up. I developed exercises for Mitch and gave him reading materials to help change his perspective about his role. By following through with his exercises, Mitch got the big-picture perspective he needed. He has since hired two managers to oversee direct reports and has restructured his role, which allows him to work as a leader and mentor instead of a taskmaster. During the achieve phase, we’ll look back on your progress while building on your successes. You’ll take the lessons you’ve learned and integrate them into your daily work life, permanently shifting your focus and allowing yourself to be the leader you’ve always wanted to be. Susan, a recently promoted corporate vice president, had a difficult time shifting her focus from being a technical expert to being a leader of a large team. She had developed a habit of inserting herself in every project and task, causing her new team to feel untrusted, micromanaged, and unsupported. After working through the discover and progress phases, Susan let go of trying to manage the details for her team. Now, she asks questions instead of telling her team what to do, and allows them to discuss and create solutions. She has redefined her role and redefined the value she provides as a leader. 2015 North American Book Award Winner! At last, effective leadership takes a new approach. In her exciting new book, national leadership expert Terri Hughes presents a method she has crafted over nearly 27 years as a leadership coach, advisor and now author. It involves a profoundly effective three-step process of discover, progress and achieve℠ you won’t find elsewhere. The technique: making "simple shifts" or practical changes to achieve self-awareness – a powerful catalyst for effective leadership. Terri has packed a lot of great gems in this book, providing refreshing, thought provoking ideas in a conversational style." I loved the toolbox. There are great practical suggestions which are easy to apply in your day-to-day work life." The case studies in Terri’s book offer a novel approach to exploring some of the most relevant, real-life issues everyone in the corporate world faces. She’s able to help leaders find solutions in a coach-like way, leaving out corporate and academic jargon." July 8, 2018 Take off Those Blinders! February 1, 2018My Team Just Needs to Step Up...? July 31, 2017Doing Vacation Right! March 8, 2017Are You Enabling Bad Leadership? September 13, 2016Lead by Asking? August 9, 2016Got That Big Promotion... Now What? July 12, 2016Is Face-to-Face Conversation Dying? March 15, 2016What's Your Butterfly Effect? February 9, 2016Accountable or Responsible? November 10, 2015Express Appreciation. Often! Thank you for taking the time to share this information with me. I will be in touch with you within two business days. Your communication with me will always be confidential. Copyright © 2019 Terri Hughes, LLC. All Rights Reserved.